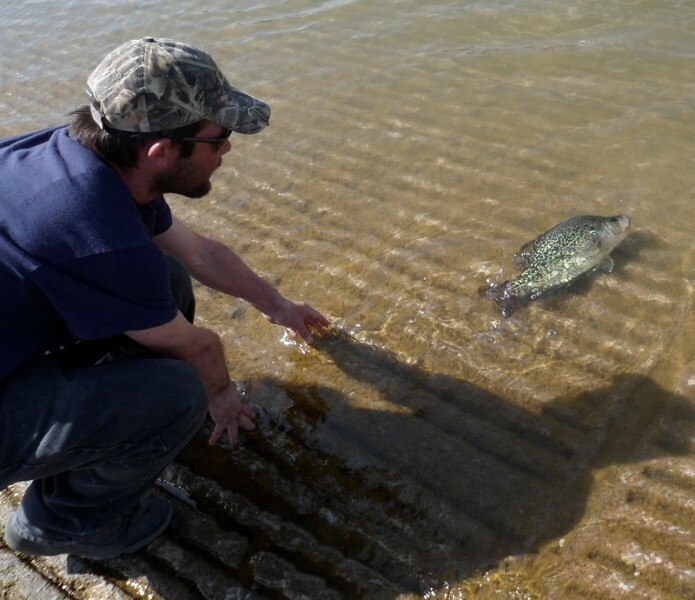 A black crappie caught March 13 from Lake Texoma could set a state record as well as two water-body records. Johnny Summers, Jr., of Pottsboro caught the 2.93-pound, 16.88-inch fish in the Highport Marina Cove using a blue-and-silver Rat-L-Trap. The current weight record for Lake Texoma black crappie is 2.75 pounds, caught in 2008. The fish was weighed and measured by Texas Parks and Wildlife Department (TPWD) Inland Fisheries staff before being released back into the lake. The fish’s length apparently qualifies it for two additional records, the Lake Texoma catch-and-release record and the state catch-and-release record. All three records are pending receipt and acceptance of the applications by TPWD’s Angler Recognition Program. The catch should also qualify Summers for a Big Fish Award. To learn how to enter fish in TPWD’s Angler Recognition Program, check current records and download application forms, visit http://www.tpwd.state.tx.us/fishboat/fish/programs/fishrecords/. Contact the staff at the Lake Texoma fisheries station by phone at (903)786-2389, FAX (903) 786-9871 or e-mail [email protected] or [email protected] .